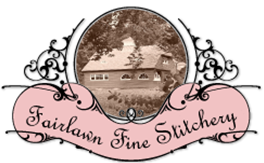 Fairlawn Fine Stitchery - Embroidered Garments & Specialty Gifts. Fairlawn Fine Stitchery is all about designing and creating Custom Accessories, Children’s Wear & Specialty Gifts. Vintage inspired items are enhanced with touches of fine embroidery and antique elements are added to compliment garments and custom linens. I cater to your unique personal style with special attention to even the smallest detail. Please view my Collections ~I hope to exceed your expectations. Copyright © 2018 ~ Fairlawn Fine Stitchery.